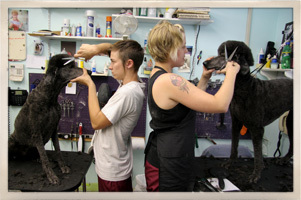 We believe regular grooming greatly benefits the health of your dog. Brushing, clipping, and de-matting removes debris, shedding coat, and dry skin, allowing the skin to breathe, permitting the coat to remain strong and maintain its luster. Dogs that are bred for coat often grow too much hair in their ear canals. If not removed, the ear canal can become blocked with hair, inviting infection. When we pluck the ears we remove just enough hair to open up the airway. Additionally, with trim nails and reduced hair in the pads, your pet will be fleet of foot. Nails should not touch the ground, and too much hair on the bottoms can cause a dog to lose traction. This is especially important for older dogs. Nails can be clipped on a walk-in basis for $8.00. It may take 1-2 visits for us to fine tune your “recipe”, but we welcome your opinion and feedback. 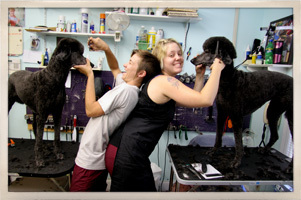 We want you to enjoy your dog’s haircut! If, for any reason, you are less than pleased, we invite you to come back (within 7 days) so we can make it as you wish. When a dog’s coat is too matted for the haircut you desire we will inform you. Matted fur is very detrimental to the skin; impeding air- flow, trapping in moisture, often resulting in sores or rashes. If we are unable to brush, comb, or use thinning shears, without causing discomfort to your dog, we will stop the process. We choose not to inflict pain and alienate the good will of your dog. In these instances we have no choice but to cut the hair shorter. 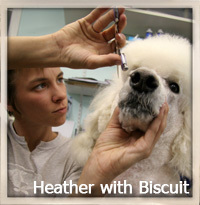 We are always happy, time permitting, to arrange for a brushing lesson so you can maintain your pet between haircuts. 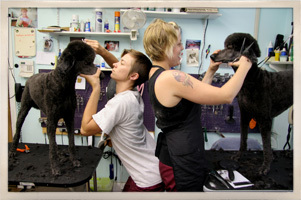 We offer services for any part of the grooming you may need between appointments. 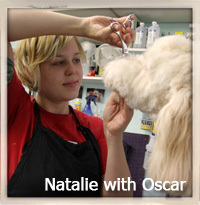 You don’t have to wait until your dog needs a full haircut to come in. Call on us with any problems you have in the interim. This increases the odds that your dog will be able to get the clip you want because it will be in good shape.